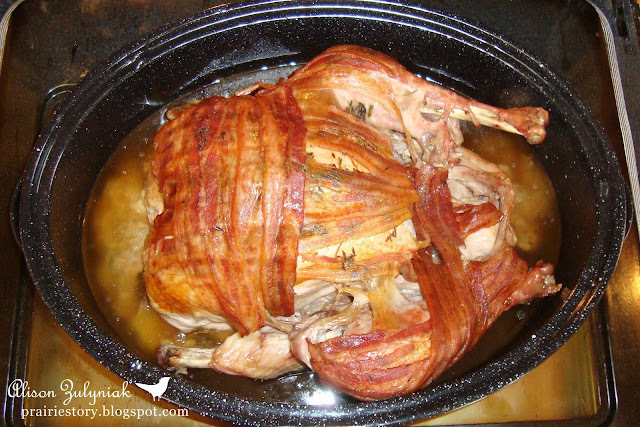 This is such a great way to roast a turkey because the bacon does the basting for you! You end up with a very moist and an abundantly flavorful turkey. - Thaw turkey in it's wrapper. This may take a day or two in the refrigerator. - Calculate cooking time based on 20 minutes per pound. - Be sure to check inside cavity and remove giblets and neck. - Rinse the outside and inside of the turkey. - Place turkey breast side up in the roaster, secure legs. - Roast until juices run clear and when thermometer in thickest part of thigh registers 175-180F (77-82C). - Be sure to check turkey the last 60 minutes before the calculated roasting time is up. I find my turkeys can be done up to 30-60 minutes early. - Let turkey rest outside oven for 30 minutes before carving. 1) Stuff turkey with onions and fresh poultry herbs (rosemary, sage and thyme) and place in roaster. 2) Make Herb Butter by combining 1/2 cup butter or margarine with lots of fresh poultry herbs (rosemary, sage and thyme), garlic salt and pepper. Cover the top of the turkey Herb Butter. 3) Then wrap top of turkey with one package of raw bacon. 4) Roast @ 350° for the calculated cooking time (see tips above). 5) Remove bacon before carving. This looks amazing!! My husband would LOVE this! Oh I bet this is mighty tasty! I can only imagine what wonderful flavor the bacon imparts on the turkey! I will have to bookmark this, my family would love a turkey prepared like that! oooooooooooooooo we're doing Thanksgiving alone this year.. this might be a super fun experiment! NOMNOMS! That is a good looking turkey! I can't wait for Thanksgiving! I love the idea of wrapping it in the bacon! I'm so hungry right now! I think it looks so good, I can almost smell it roasting! Thank you for posting your recipe! We did this last year for the first turkey we ever made... boy, is it delicious!! This turkey looks amazing! I think we've found our Thanksgiving recipe! Oh my gosh! Heart attack in a roaster! I love it. Hope you had a great Thanksgiving! I have never heard of this method of roasting a turkey. Everything is better with bacon! YUM! Do you throw the onions out once you carve the turkey? Do you put the herbed butter over the skin, or under it? It sound really delicious. Not sure anyone is still checking here but I hope so bc I am looking for a recipe like this and saw that u discard the bacon. Really?!?! I assumed you ate it with the turkey? That part makes me a bit sad!